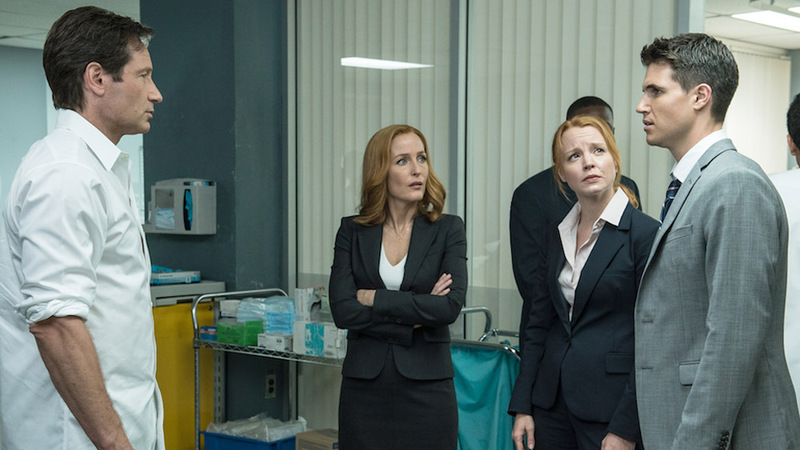 After the unenviable task of being the one to turn the lights on a few weeks ago when this new series of X-Files lurched out of its hibernation, series creator Chris Carter was able to write and direct his first true episode of the all new X-Files. While his opener for this season was somewhat disjointed and uneven, this second effort not only shows that Carter has an unshakeable handle on this latest incarnation of his two-decade-old-and-then-some franchise, but that he has eyes on the future as well. 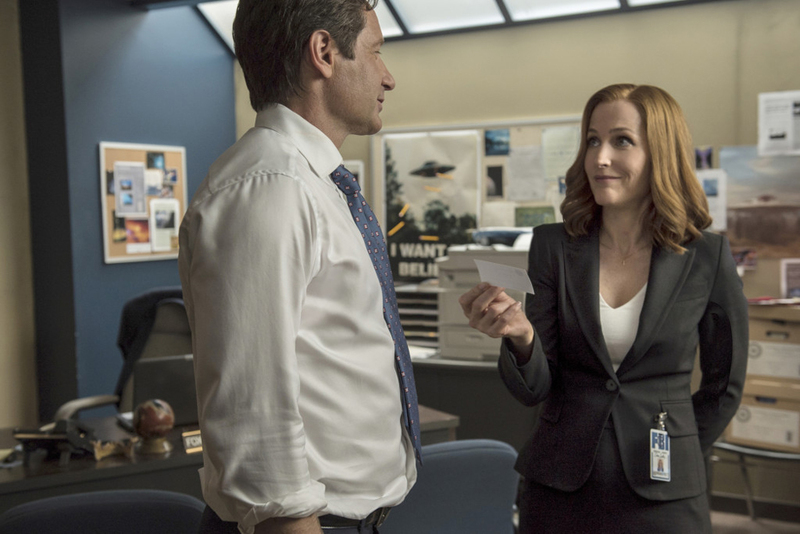 Sure, it’s something of a “Ripped from the Headlines”/“Very Special Episode” of the X-Files, but the feel is loose and jaunty enough to separate it from the tired tropes of the countless acronym procedurals over on the other stations. Also, I’ve never seen Mark Harmon or George Eads tripping balls as an avenue of investigative query. Sherlock, sure. Mulder and Scully join Agents Miller and Einstein in an effort to bring down a terror cell in Texas after a suicide bombing at an art gallery. One of the bombers survived, but is in a vegetative state. Scully and Miller pair off to pursue a scientific method of communicating with the comatose terrorist by monitoring his brainwaves during questioning. Meanwhile, Mulder asks Einstein to assist him to the same end using decidedly more illicit means. We are left with a meditation on the nature of an angry deity and those who would choose to follow him. And Mulder might hear angels blowing apocalyptic trumpets. This episode was really a tightly-wound piece of storytelling-with-a-message. If I must point out a flaw it would be that Carter gets a tiny bit preachy in his teleplay and insists on driving home a message of peace through greater understanding. But his messaging is well worth exploring and should probably be a part of the ongoing conversation. When you subscribe to a religion, you have choices to make within that belief system. Nearly any deity has a rash punishing aspect standing in direct contrast to its role as creator and nurturer. Rather than reconcile these diverse aspects, followers often choose one to run with. Extremist groups like Westboro church seem to have fully embraced the lawmaker aspect of the God of the Bible, while others quietly practice a gospel of tolerance, understanding, and forgiveness. 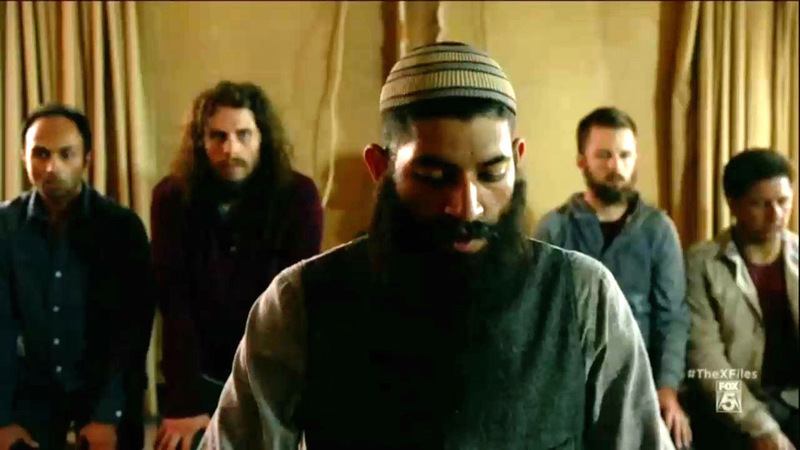 Extremist groups in the Muslim world carry out acts of outrageous violence in the name of the same Allah is commonly referred to as Al-Rahman (the most compassionate) and Al-Rahim (the most merciful). It’s certainly confusing, but is also a reflection of our own inner dichotomies. Every person has a violent side that thrills at car chases and explosions in action movies, but also a side that appreciates the wonder of creation and can’t help but say “Awww…” at videos of kittens and puppies on the internet. Is it any wonder that our chosen deities are going to seem a little inconsistent to an outside observer? Epicurus once posed the paradoxical treatise: “Is God willing to prevent evil, but not able? Then he is not omnipotent. Is he able, but not willing? Then he is malevolent. Is he both able and willing? Then whence cometh evil? Is he neither able nor willing? Then why call him God?” With this episode, Carter attempts to provide his thoughtful insight into one of the driving elements of our global culture. Speaking of dichotomy, in the midst of all this ideological exploration, Mulder does ‘shrooms and has a full-on Hank Moody montage set to “Achy Breaky Heart,” “Honky-Tonk Badonkadonk,” and even a bit of Tom Waits’ excellent “Misery is the River of the World.” It’s wild and trippy and unlikely-to-ever-get-the-image-of-Fox-Mulder-country-line-dancing-out-of-my-head fun. If you blinked during this sequence, you might have missed an important visitation. 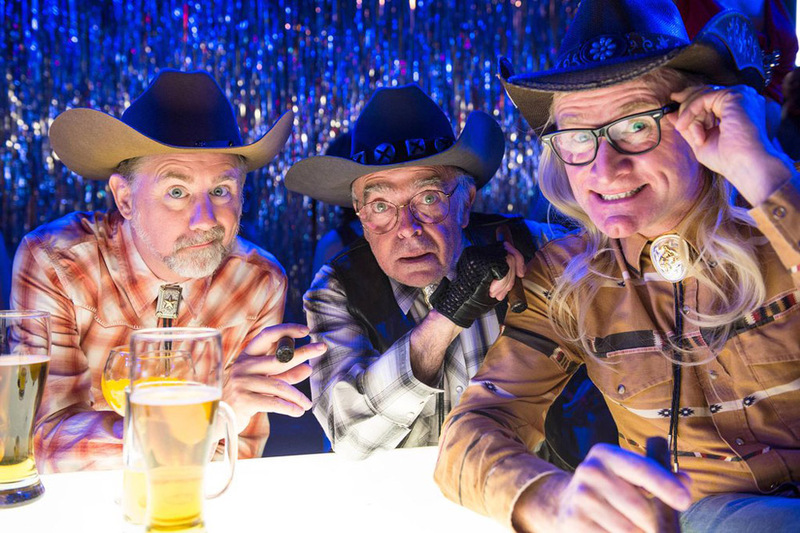 Mulder’s altered state finds him ogling Texas-style badonkadonk at a table shared with Walter Skinner and the Lone Gunmen. The long-lamented Langly, Frohike, and Byers flash quickly past the screen in their Western regalia with a hazy flourish. It goes by quickly and nearly without note. This magical mystery tour is the very thing which brings forth the break needed to shut down the terrorist cell and prevent further deaths at their hands. But what about these new agents? Mulder and Scully have settled back into their bantering camaraderie and may even be inching closer to the relationship they once shared. But Agents Miller and Einstein seem to be a pairing which could bear further exploration. Just as Mulder and Scully were established upon the eternal conflict of paranormal pursuit versus scientific inquiry, it seems that Miller and Einstein could become avatars of the conflict which stands as the defining clash of our time. It wouldn’t be much of a stretch to see Agent Miller as subscribing to a politically liberal agenda, even as Agent Einstein subscribes to a more conservative political leaning. If Carter has designs on a sort of X-Files: The Next Generation opportunity to spin out of this revival series, he may have found his Riker and Crusher (AD Skinner is Picard in this scenario). Time will have to tell if Lauren Ambrose and Robbie Amell are able to pick up the 1000 lumen tactical flashlights and pursue a new generation of woo-woo supernatural. Duchovny and Anderson’s schedules (to say nothing of their stamina) are unlikely to allow either of them to return to any sort of a full-time series commitment, but with the new blood working the cases when they’re not available, further seasons begin to seem a more reasonable possibility. I am taking heart in the fact that next week’s episode is being advertised as the “Season Finale” and not simply a “Finale” or “Series Finale” to be an openness on the part of the network to make this revival something more than a limited series event. So far, the ratings have been pretty strong, which seems to bode well. But let’s not jinx anything by getting ahead of ourselves. There’s still the matter of the finale next week and what might come in the resolution of the story set in motion during the first episode this season.